I so enjoy making string quilts. I will be teaching a class to my quilt club on Saturday on how to make a string quilt so of course, that meant I had to start one. This was my first block. I chose to use all Fall colors with a center string made of a dark green fabric. 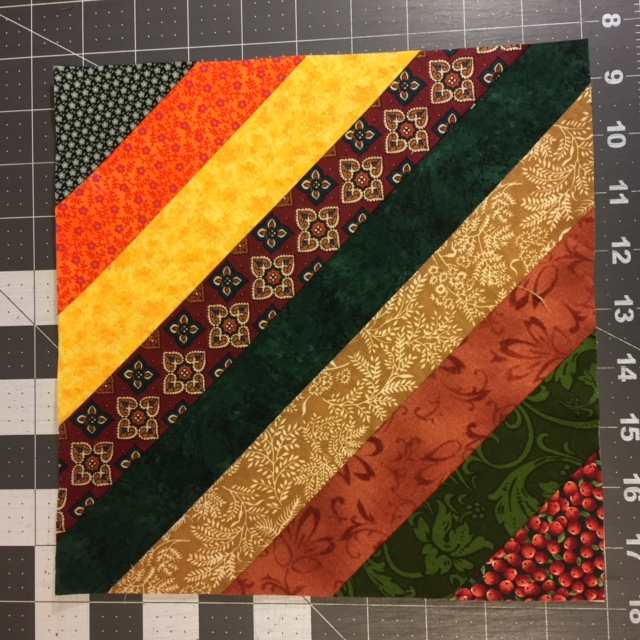 This block is different from string quilts I have made in the past, in that all the strings are the same width and seams will therefore need to meet. Therefore we are drawing lines on the muslin foundation where the edge of the string will line up, and then sewing a 1/4" seam across. 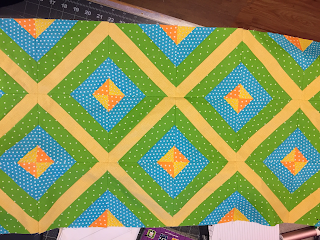 Here are two blocks sewn together and I am so happy to see the seams lining. Sometimes they are just a little off, but I think it still looks great. So while I was out of town this past week, I kept thinking about these strings, and got to wondering how would it look if is was not scrappy, but rather just a few choices of fabrics. I have a baby quilt for a boy to make for an expectant mother in my church, so I decided to give this a try for the baby quilt. 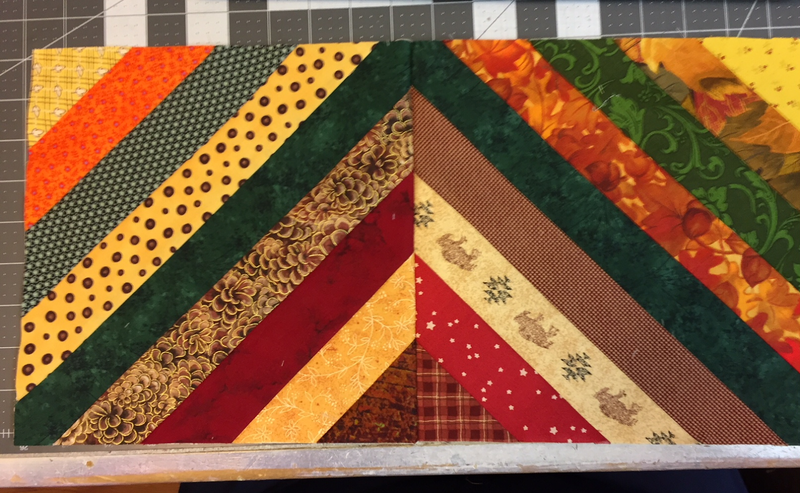 The first block is 9 1/2", which is too big for a baby quilt, so I drafted out a 6 1/2" block with 4 fabrics. 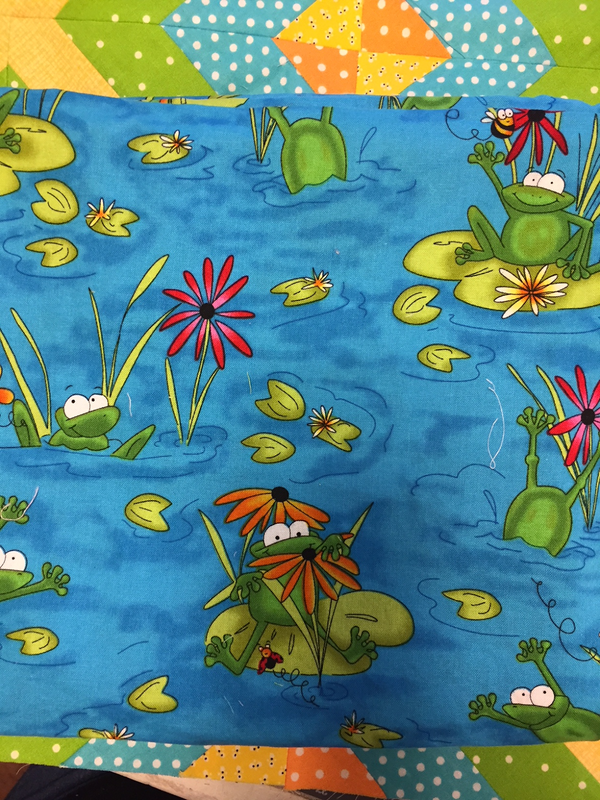 I had some fabric with happy frogs to use for the backing and I just went to my stash and looked for fabrics that I could match up with the backing. 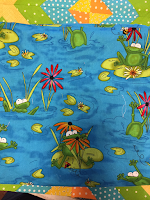 This is also a fun quilt to make. I am really liking the pattern created. I did have to had on additional fabric next to the orange in the center. I did not have enough orange, so chose another yellow and this creates an hour glass block in the middle when I sew the blocks together. Cute little string quilt. I'm also working on a string quilt.